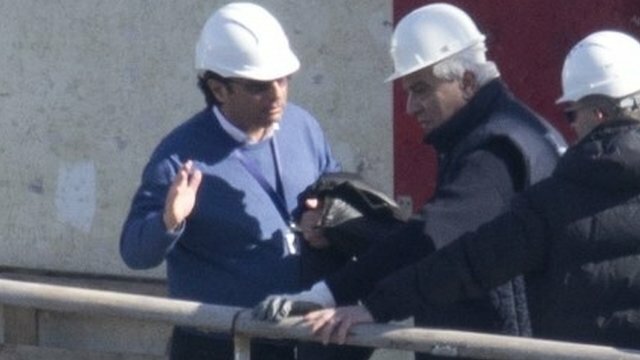 Captain Francesco Schettino has returned to the wreck of Costa Concordia cruise ship for the first time as part of his manslaughter trial. Costa Concordia hit a reef near the island of Giglio in January 2012 and capsized, with the loss of 32 lives. Francesco Schettino was taken to the wreck on board a small boat, two days after travelling back to Giglio. He denies the charges of manslaughter and abandoning ship, which could see him jailed for up to 20 years. The captain arrived on the island off the Tuscan coast on Tuesday and is said to have wept when he saw the wreck from a ferry taking him to Giglio. Francesco Schettino attended a health-and-safety briefing at a hotel on Thursday morning to prepare him for the short boat trip out to the wreck, on which he was accompanied by a group of court-appointed experts. He was taken out to the wreck on a small boat and was then seen standing on the ship itself. Francesco Schettino was being allowed on to the ship “as a defendant, not a consultant”, said Judge Giovanni Puliatti. The 290m-long vessel was righted in September 2013 in one of the largest, most complex salvage operations ever, but remains stranded after its ill-fated journey. Francesco Schettino has been accused of leaving the luxury liner before the 4,229 people on board the ship were taken off. “They want to show that I am weak, just like two years ago. It’s not true. I want to show I’m a gentleman, not a coward,” Italian media quoted him as saying. He lambasted the media “frenzy” surrounding his return to vessel, describing those who accused him of abandoning the ship of not understanding “a bloody thing”. “There is a frenzy that is making me nervous,” Francesco Schettino told journalists and cameramen who surrounded him. Correspondents say that he grew increasingly angry on the dockside after the visit, frequently gesticulating as he nervously paced around. Francesco Schettino has already accepted some degree of responsibility, asking for forgiveness in a television interview last year as he talked of those who died. But he denies abandoning the ship after it hit a reef near the island. The captain maintains he managed to steer the stricken vessel closer to shore so it did not sink in deep water where hundreds might have drowned. Francesco Schettino’s lawyer Domenico Pepe said the captain’s former employer, Costa Crociere, had shifted the blame towards him. An Italian court convicted five others of manslaughter in July 2013. They had all successfully entered plea bargains, whereas Francesco Schettino’s request for a plea bargain was denied by the prosecution. The complex operation to salvage the Costa Concordia took 18 hours and followed months of stabilization and preparation work by a team of 500 engineers and divers. Ports in the UK, Italy,France, Turkey and China are now bidding for the lucrative contract to dismantle it.